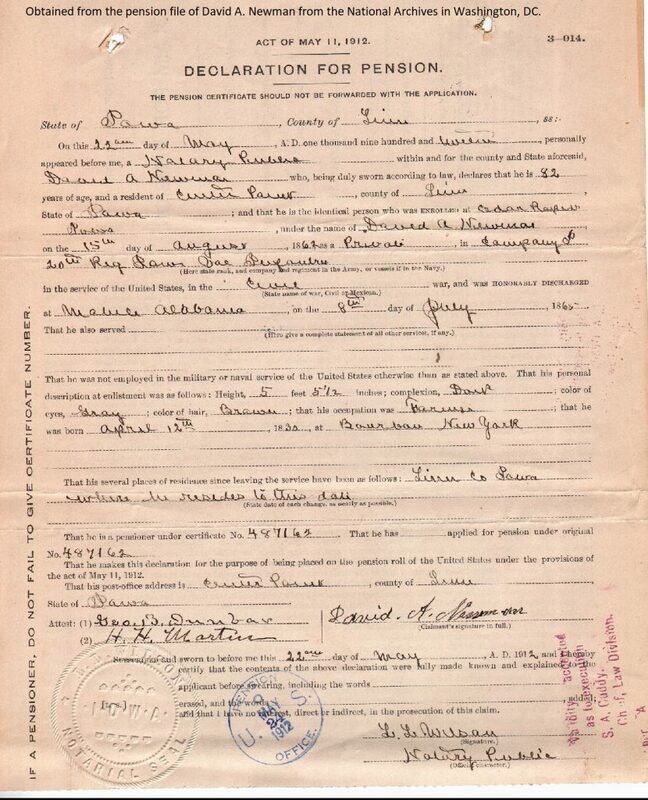 A declaration for pension made out by David A. Newman on 22 May 1912 in Linn County, Iowa, stated that he was born on 12 April 1830 in Bourbon County, New York. 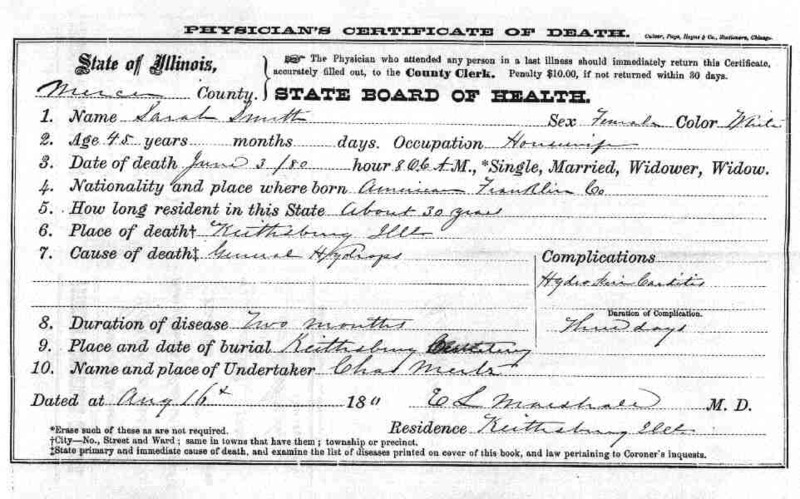 The writing is clear and that’s how I’m going to transcribe it because that is what it says: Bourbon County, New York. However it’s wrong. Of course it’s not wrong simply because I said so. Far from it. After all, it’s not a date of which I have any first hand knowledge. On virtually every other record where David provided a place of birth, he gave the state of Kentucky. If a county was given, it was usually Bourbon. David’s parents lived in Kentucky from their 1815 marriage in Bourbon County, Kentucky, through at least the 1830 census. At some point they moved to Indiana and lived in at least two counties in that state. There’s nothing indicating they ever lived in New York. And while it’s possible, it doesn’t seem likely since every other record on David and this family indicated they were in Kentucky from 1815 through sometime in the 1830s. I don’t know why this record says New York. There’s nothing on the document to indicate where the place of birth came from and I certainly was not there to witness the creation of the declaration. Seeing the New York reference did cause me to go back and review what I had on this family during the time period David Newman was born to Augusta and Melinda (Sledd) Newman. Nothing suggested they were elsewhere. Of course, it is always possible. It’s just not too probable. And it’s not too probable that every other document is wrong and this one is correct. It certain is possible. But it is highly unlikely. What’s more likely is that the reference to New York is a mistake. I’ve seen a reverse problem in another family. In that case the relative was born in New York, but is listed in one census when his daughter indicated her father was born in Kentucky. In that case, an examination of census entries indicated that the enumerator used two letter abbreviations for many locations and had somewhat sloppy handwriting and apparently confused “Ny” with “Ky.” Their “N” and “K” letters were different but similar. Is that what happened here? Don’t know. It could be that David orally provided the information for the declaration. It could be that he brought his discharge paper, family bible, and perhaps other documents with him to have the declaration filled out and some of those handwritten documents might not have been too easy to read by the individual filling out the form. David died two years after this declaration was made out. How aware was he of what information it contained? The witnesses are not close family members and would have been less likely than a son or daughter to have noticed an error. And it’s worth remembering that witnesses are testifying that David signed the document and that they knew who he was, not that any of the information contained in the statement is correct. My transcription of the document is true to the original. I may add sic after the birth place in New York to remind myself later that it does give that state. My discussion of the reason why is best left to what I really know and that discussion needs to be clearly made separately from my transcription. I’m fortunate that I have enough records on David that I know not to look for him in New York State. Sometimes we are not so lucky. I wondered why they were all dressed up. There had to have been some sort of “occasion” as most of the snapshots of the Neills show the men in more traditional farmer attire (son-in-law Armin Shanks was a school teacher as was his wife Nellie) and the ladies in less formal dresses. Common sense told me it was not that all the Neills had been to church. The attire also indicated that the picture was probably not taken in the summer or in the depths of winter. But why were they all dressed up? This is one of the few pictures I have of the entire family in one shapshot. The other photographs from the 1920s and on do not include the entire family group. This picture was one that was in Fannie Rampley Neill’s collection of photographs which are in the possession of a family member. The same picture was also in an envelope in her daughter Nellie’s collection of photographs. Written on the envelope was a note indicating that the pictures were taken when son Herschel had come back with his new bride. The couple had married in Texas where he was stationed during part of World War Two. There was a second photograph including the newlyweds. 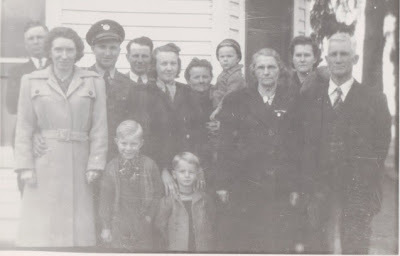 Identifying the people in the photograph also led me to believe that Herschel took the first picture (he and Mary Ann are not in it) and that Armin Shanks took the second picture as he is the only one absent from that picture. One cannot always tell the reason why a family got together and it’s not always obvious who took the picture either. But sometimes there are clues–one just has to look. Before we found the envelope explaining why the pictures were taken, we were using my father’s birth to approximate the picture’s date (he’s the one being held by his mother in both snapshots). My Grandma Neill (Ida [Trautvetter] Neill) would have said they were “all dolled up” for the occasion. Somehow I just can’t bring myself to use that phrase to describe my grandfather. 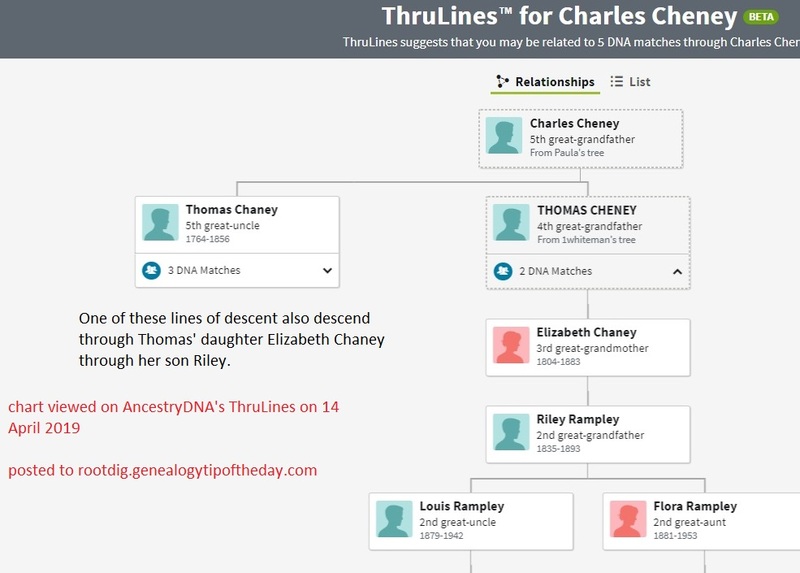 ThruLines at AncestryDNA in their display of data in my ThruLines descent is indicating something is in my tree that is not. This screen shot from my ThruLines for John G. Trautvetter contains information from my database for every entry that’s in a white box. The gray box information is not in my online tree. Reading the image, it is saying that John and Theodore Trautvetter are half siblings–after all John M. is my 2nd great grandfather and Theodore is stated on the image as my “half 3rd great-uncle.” This suggests that the two men are half brothers in my tree–after all the boxes are white on the screen indicating the information is from my tree. But apparently ThruLines is pulling that “relationship” from that tree and modifying it in the display that it claims is from my tree. If it wants to suggest things from other trees in my ThruLines that are not in my online tree, that’s one thing. But don’t say all the information about two men is from my tree and then grab a relationship between them that’s in someone else’s tree. The 1823 death entry in the church records of the Evangelical church in Wohlmuthausen, Thuringen, Germany, list her name as Anna Catharina Trautvetterin. That’s how I should transcribe it because that’s what it says. Do I have a new surname for this family? Do I have a new spelling? Not really. In fact, I have Trautvetter–just a feminine version that was used in the area during this time period. Names are always transcribed as they are written and they are analyzed in context. Anna Catharina’s entry is not the only one for a female on the page of entries that has a last name ending in “in.” Her entry is typical, not atypical. That’s something one does not discover if one only looks at the item of interest and does not give any thought to cultural and linguistic patterns. Ever feel like you are the only person on the planet researching a family from somewhere in 1750? Sometimes it feels that way. 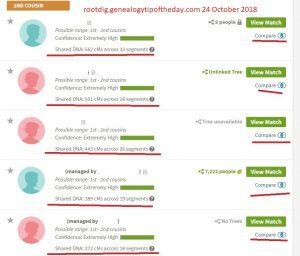 Other times it feels like hundreds of people are researching the same family and a proportion of them repeat errors in old genealogies that have been corrected decades ago. That’s another issue for different reasons. This post is about feeling lonely. That seems to be an excellent way to look at it. While it can be frustrating to research a family that no one else is seemingly interested in, it is an opportunity to make discoveries and, in some way, bring those families back to life. At the very least it is a chance to make those stories known and to connect those individuals with other family members. Many times these “unresearched” ancestors are more difficult to research–that’s often why they are unresearched. It may be that no one has even remotely connected the family to any with living descendants. It may be that other descendants simply are not interested in them for one reason or another. If you are fortunate to make discoveries on these individuals and post the information in any public forum, there’s always the chance that someone else incorporates the information into their tree without any communication with you. That’s the reality. That’s the chance (or opportunity–depending upon your perspective) that you take when you post any information publicly. There’s no control over information once it has been posted and, as we’ve stated before, statements of fact cannot be copyrighted. Copying paragraphs of your analysis and putting it on as their own is a separate issue and is a violation of copyright. Whether it’s courteous to communicate beforehand when reusing facts is a separate issue, but I can guarantee that it more the exception than the rule. 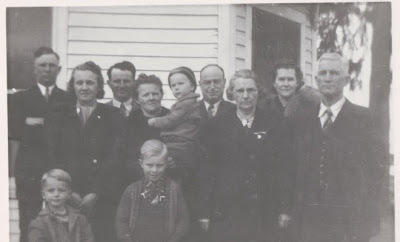 When a person has researched a family for some time and has worked through research challenges with them sometimes they feel something of a connection to those ancestors. That’s understandable. It’s understandable too why it’s frustrating when someone “copies” that information and puts it forth as their own. The other option is not to post the information publicly. My philosophy is that by spending that time researching that specific family helps me to know them better than someone who simply copies my facts and puts them out there as ones they discovered. I’ve gained something that they haven’t. Wading through the research gives me more of a connection with individuals than simply copying and pasting facts. That’s something the copy and paster won’t get. And time spent waging battles with the copiers and pasters takes away time from my research on those families that haven’t been worked up. Or working on those families where there are lots of mistakes and gaps. I’d rather spend my time doing that. Words elude me. While ThruLines had some issues we’ve discussed before at least it wasn’t somehow displaying information from my tree incorrectly or altering it based on other trees. 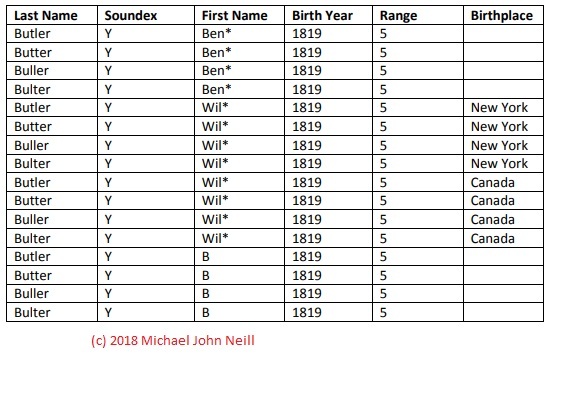 This screenshot of part of my ThruLines for my third great-grandfather shows a display that apparently has taken information from my tree and not just added new names, but modified what is in my own tree. I’ve removed living people from the ThruLines image, including myself. The information in the white boxes in the image is from my tree. The gray boxes are from the apparent Ancestry.com data abyss. It shows my descent from my mother, grandfather, and great-grandfather correctly. Beyond that all digital hell breaks loose in such a way that I don’t know how to begin describing the errors. Note: this is not a family where I am doubly related to the individuals shown. Noentje Grass’ entry has been split into three entries–two of which are shown as private in this tree. She’s my 2nd great-grandmother. My lineage from her in the chart indicates she is my aunt. The three men, George J. Frederich Janssen, and Johann J. Ufkes are all brothers–sons of the same man and woman (Noentje Lena Grass). The lineage boxes that has my correct relationship listed to those two ancestors actually goes through my great-uncle (shown) through one of his children (not shown). Extending information to my tree is one thing. This is something else.